After coming back from the busy Paris Spring Fashion week 2014, the brunette beauty was walking with grace and confidence not knowing that her zipper was undone. This Wednesday the famous singer was walking through the International Airport of Los Angeles with grace and a smile on her face and her main objective was to reach her car. The 22 year old singer was very close to having the ‘OOPS’ moment because of the clothes she wore on her way to the city of lights i.e. Los Angeles. Despite the minor slip, the beautiful Spring Breakers star was looking fabulous and fashionable. She was wearing a midriff-baring blouse that had circles on it and some orange embroidery. To add a bohemian touch to her overall dress and to keep herself warm and cozy she wore a black jacket. She also wore skin tight blue jeans and in order to reach the height of perfection she wore chic mirrored shades. Her gorgeous long dark hair was slightly loose and was held back with the help of a thick braided band. She was followed by a team of security guards and she had her mobile phone in her hand. During her visit to Louis Vuitton earlier that day she was considered to be the epitome of grace and magnificence. She was wearing a pink and black patterned mini-shirt with a distinctive circle print blouse and to give her height a boost she was wearing black heels. She carried a bright shoulder bag that matched her outfit. She was posing with the famous fashion designer Nicolas Ghesquiere and showed her gratitude for all the hard work that was put into the show. Selena looked stunning at the CR fashion book launch party that took place a day before. She was wearing a silky black jumpsuit that had a plunging neckline and with that she was wearing white and black pumps. All in all she was looking lovely, attractive and stunning. 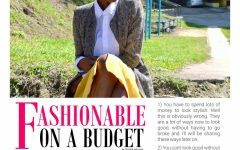 Column Feature : Fashionable On A Budget By Elizabeth..